A long-time resident of Wayne with over 40 years of legal experience, Mr. Bacher not only genuinely cares about the legal issues that affect the members of our community, he also possesses the skills and resources necessary to handle even the most complex cases. Certified as a civil trial attorney by the New Jersey Supreme Court and licensed to practice in both New York and New Jersey, Mr. Bacher has a long record of successfully advocating on behalf of those in need in order to protect their rights and entitlements, and help them secure the most favorable outcomes possible considering their circumstances. When working with our law firm, you can expect to receive Mr. Bacher's full attention to your case, and he will remain in constant contact with you throughout all legal proceedings to ensure the best odds of helping you achieve the positive results you seek. From this level of client commitment, Mr. Bacher has earned a reputation as one of the top attorneys in the region, and he holds a perfect 10 out of 10 rating from Avvo. 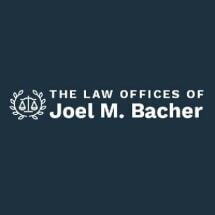 For top-notch representation from an attorney dedicated to helping you obtain justice for your serious legal issue, you can contact The Law Offices of Joel M. Bacher to schedule a free initial consultation.